On the National List of Threatened Species, it appears in the “Of Special Interest” category. In the 2004 edition of the Red Book of Spanish Birds (Libro Rojo de las Aves de España) it is listed as “Extinct at the Regional Level”. The degradation of its habitat due to the clearing of oak groves and the increase in irrigatied crops, as well as the extermination it faces from farms because of the damage it causes to crops. In Gallocanta Lake this is a very serious problem, since it is also an area through which migratory birds pass. 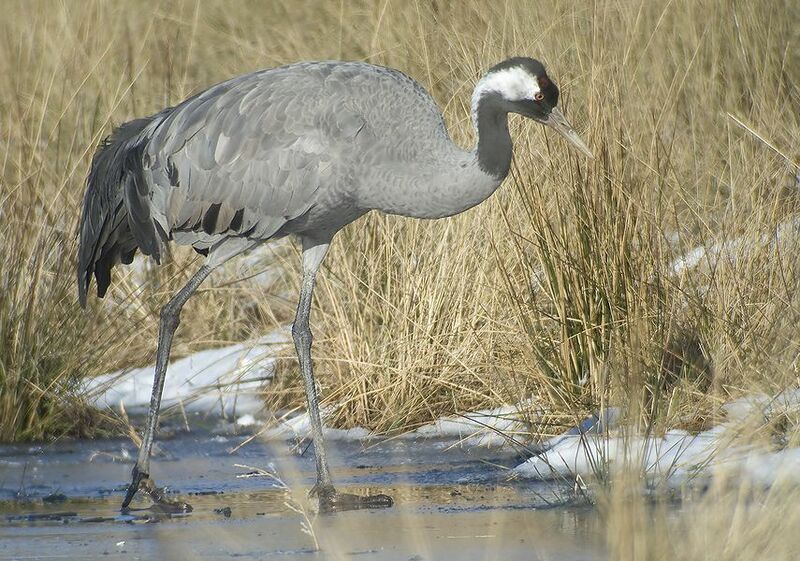 Identification: Large, slender bird with long legs and neck. It is an ash grey colour, and at the tips of its wings this colour is even darker. Its head is black, its crown red, and it has some white horizontal bands that begin at the eye and run down the neck. Juveniles are brownish and lack the characteristic head pattern found in adults. In flight these birds maintain their head and legs outstretched and fly in flocks in the typical V-formation. This, together with the sounds that they constantly emit, makes them easy to recognise. Song: It makes far-reaching sounds that sound like a trumpet, "crro-crro". Diet: During mating season it feeds on roots, tubers, fruits, leaves and seeds, which it complements with worms and insects. During winter it feeds on acorns, and once that food supply has been exhausted, it eats grains, pulses, worms and snails. During breeding season, it occupies swampy and wetland areas with aquatic vegetation. 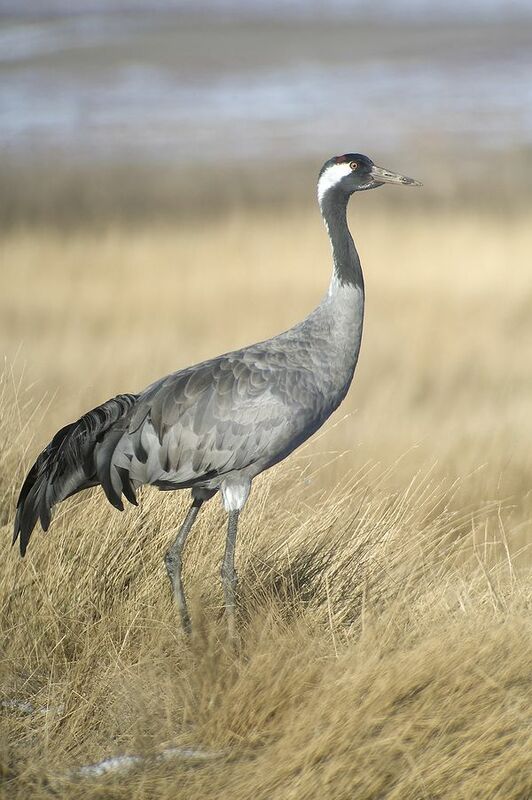 In winter, it is found in farmland, rice fields and grasslands during the day, but when night fallts, it concentrates in roosts located in reservoirs, lakes or marshes. In Spain: In winter, Spain is its principal destination: it concentrates in Toledo, Córdoba, Cáceres and Badajoz. During migration it can be seen in different places in Castile and León, Aragon, and eastern Castile-La Mancha. In Castile and León: It is especially distributed in the regions of Tierra de Campos (Palencia-Zamora), Tierra de Medina-La Moraña (Valladolid-Ávila) and Valle del Tiétar (Ávila). Its primary wintering site is the Rosarito Swamp (Ávila). Movements and migrations: The first specimens begin to reach the peninsula in October after crossing the Pyrenees Mountains in Navarre and reaching Gallocanta, an important wintering area, while other continue on their path to the grasslands in the southwest of the peninsula. Between February and March, they return to their breeding areas, again crossing Gallocanta and the central section of the Pyrenees. During migration and wintering the family stays together; however, when they return to their breeding areas, the adults lead the way. 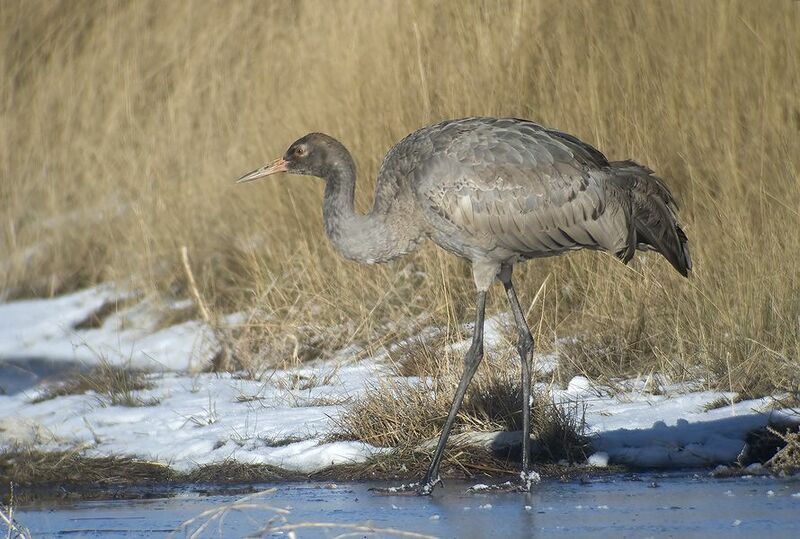 In Spain: There is an estimated population of 75000-82000 wintering specimens. 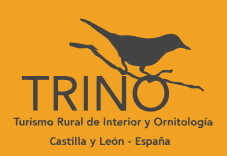 In Castile and León: During winter, there is an estimated average population of 2332 birds, with this number suffering sharp fluctuations from year to year.